Our bodies are our responsibility to nurture and protect. They are ours and ours alone! Is there any greater responsibility than the one we have to honor the vessel we have been given to move through this journey on earth? NO! So, let’s move beyond the misconception that size doesn’t matter. Yes, we should embrace the body we have and live in a state of gratitude not shame, but our responsibility to take care of our vessel lies solely upon each one of us. There are significant health risks associated with carrying too much weight on a human frame. Let’s identity the methods to accurately track your body weight, body fat and circumference measurements along with learning more about the risks of being over weight and how we can gain greater control of our progress. Eat FRESH veggies and fruits with meals avoiding precooked or preseasoned veggies (canned or frozen.) FRESH is always best! Eat high quality fats such as nuts, avocado and olive oil. Avoid oils that are “shelf stable” like canola or vegetable oil. High quality fats are necessary for brain health and hormone function. Eliminate alcohol and sodas, even sports drinks that are not part of your training. Reduce stress! High cortisol levels disrupt natural hormone production and the body’s ability to use fat for fuel. 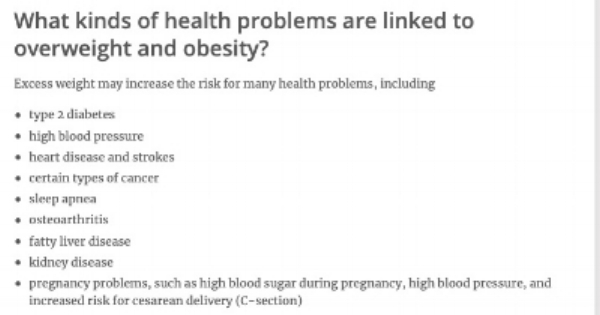 Stress and food related disease are America’s top sources of death and disease, NOT diseases from genetics! Sleep! Your body needs adequate sleep for hormone regulation and production, digestion and regrowth. Set a goal and measure! Weigh in once or twice a week and join and accountability group.